The next task was to build the unit to hold the plane rack. 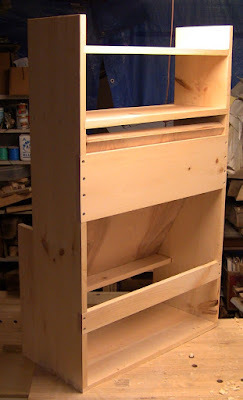 It's just a pair of upright sides with shelves, and a space for the rack. 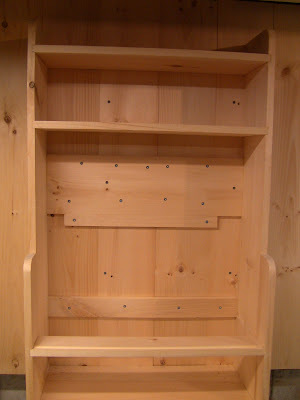 The bottom shelf is dovetailed to the bottom edge of the sides, and the other shelves are in dadoes. Since the rack needs to be angled, I molded a lip into the edge of the front ledger where the rack would rest. Molding the lip with the corner of a shoulder plane. Rear view detail showing the front ledger in place in a stopped dado. The rack in place resting in the lip. Rear view of the assembled unit. The top of the rack rests against the top of the upper mounting stretcher. Since this stretcher will bear most of the weight of the unit once it's hung, it's wide and securely glued and screwed in. The lower stretcher will provide some additional support. 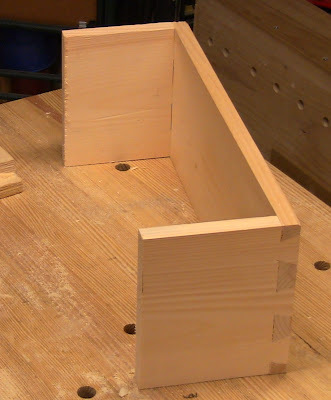 The lower portions of the sides have extensions glued on to widen them. This deepens the unit to accommodate the rack at the right angle. It would have been angled too high without the extra width. A consequence of using cheap lumber that's cupped: some of the sloppiest dovetails I've ever done. You can see light through them. But things are still solid because this is such a good mechanical joint. The unit mounted to the wall boards. I used a light cleat just to get things aligned working alone, then plenty of beefy screws through the upper and lower stretchers, including into the studs. Then I set the rack in place and drove two screws through the bottom edge into the front ledger, and two more near the top edge into the rear stretcher. The rack and shelves loaded for bear. 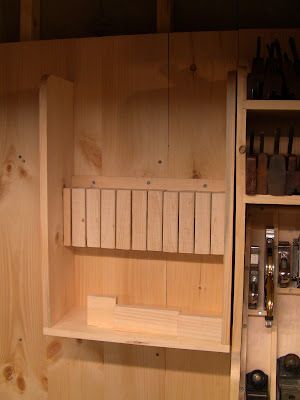 The bottom shelf with the extended depth accommodates my longer wooden molding planes. With the upper shelves, I have 6 linear feet of storage space for molders. Having completed the plane storage, the next item was a saw till. Planning the saw storage, all ripsaws followed by all crosscuts. A nicer layout: rip and crosscut in each size. The saw till mounted. Similar construction to the plane storage, though it needs to support much less weight. The center stretcher has 2x3 blocks nailed in from behind, with space for each saw blade. The blocks on the bottom are glued and screwed to the bottom to catch the horns on the saw handles. The till loaded, with a coping saw hung from nails above the short saws. 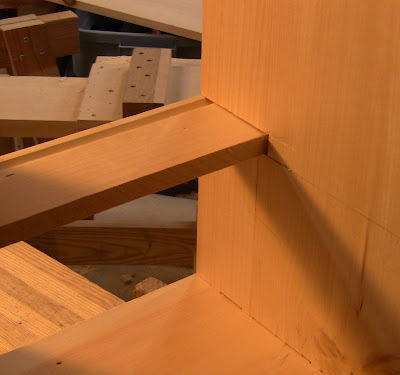 Detail showing how the lower blocks catch the handles, acting as a pivot to cant the saws into their slots. After fiddling around for a bit, this proved to be a very effective method, providing solid support. 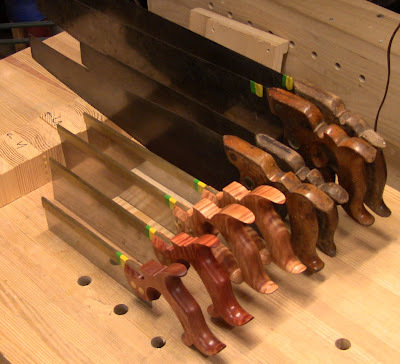 The different handle sizes meant no single front support would work with all the saws. I made one significant error in designing the till. 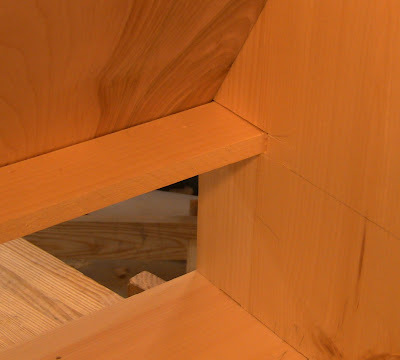 It was originally four sides dovetailed together. Unfortunately, even though it was longer than the longest saw, it was too short to allow pivoting the saw in and out. So I cut the top end off, resulting in the open-end design you see above. The leftover top end. Maybe I'll turn this into some kind of little shelf thingy. Next on the list: chisel storage! 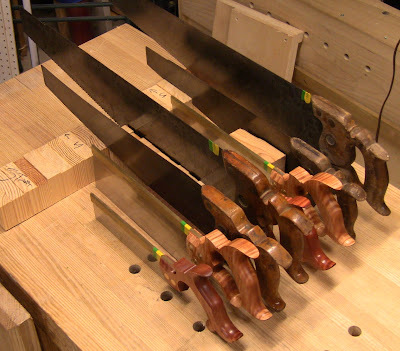 Per Carl Swensson, the chisels will go on simple racks with cutouts designed to allow them to lift out slightly (as opposed to sliding them all the way out of holes). Two rows of chisel racks and other assorted items mounted. Boring tools will go in that big empty space under the chisels. The chisel racks are surprisingly time-consuming to layout and cut because of the number of slots, trying to get a good spacing. 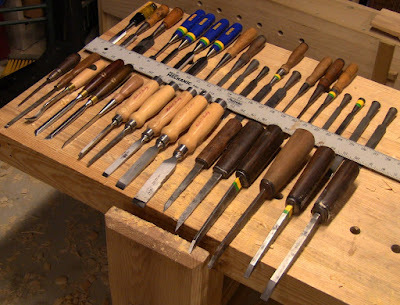 My random collection of chisels looks a bit ragtag, and I need to make handles for several of them. I may redo the chisel racks a little more carefully. I just cut straight slots, but a better design I've seen is to bore and counter-bore holes to accommodate the slope on the chisel necks, then cut the slots to those. That way the chisels sit better in the holes. But this will do for now. 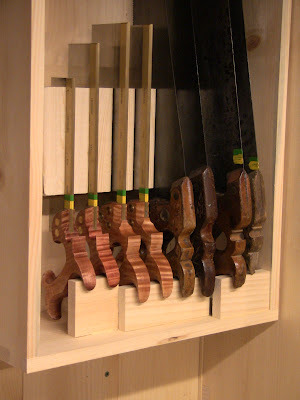 Making these little racks, you invariably leave out a tool or break something off while cutting, or you change your mind about something or buy another tool, so you can expect to have to rebuild one or two. For instance, because I have all the hammers flat against the wall, they take a lot more room than if I rotated them, so I may redo that one to make room for something else, like my Yankee screwdrivers. 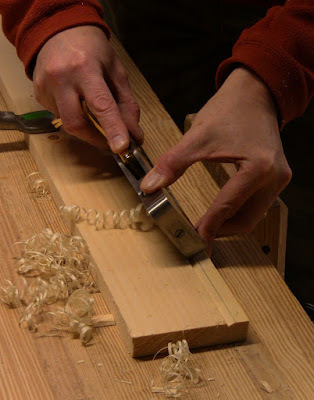 The construction here is very simple, easily within the skill of a beginner, and the results are very satisfying. Total cost of materials and hardware (screws and nails) is about $170, though I may add another panel for about $20 more. 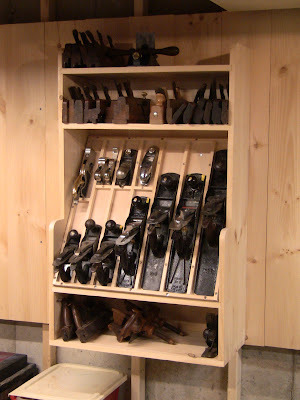 I've seen pictures of magnificent workshops where the tool storage is more like fine furniture. While we'd all like to have a shop like that, it's pretty intimidating for a novice. This simpler method allows you to get organized quickly. Then you can upgrade things over time, as your skills improve. Steve, great storage solutions, and glead to see you back in the shop! A quick question for you: What made you decide to go back to a more fixed-storage model, rather than mobile-storage? 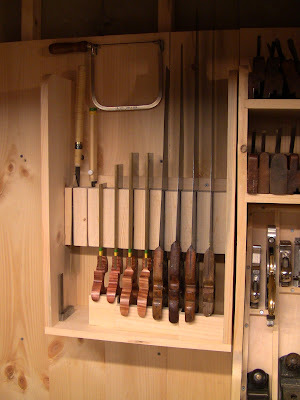 A while back I read about your tool cart that you converted to keep your hand tools close and handy when your work at the bench, and how well that worked for you. Did you find some limitations to that system, or did you just need more storage than you could fit on the cart? Oh, and if you do a spring class in Littleton, count me in!! Thanks, guys! 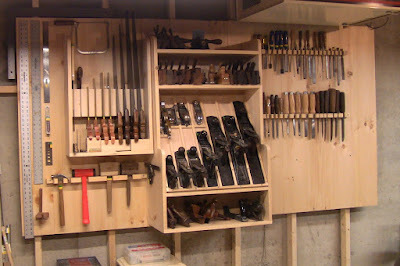 Yeah, simple and low tech was one of my goals, so I didn't get carried away spending months just building tool storage. Lance, the tool cart was ok, but almost immediately it ran out of space and I was trying to crowd too much onto it. Then the top became the dreaded horizontal surface where I piled stuff up. The other thing was that it was a bit of a nuisance to move the cart around to get access to the things on the various sides. Not terrible, but just that extra bit. The thing the cart did help with was prototyping how I wanted to work. It showed that when I had things accessible next to me, they were easier to use, and I did a better job putting them back and keeping them organized. That pushed me to the vertical panels off to the side concept; the cart acted as vertical panels to the side, just not enough panels, and I didn't like having to move it around to get to them. So this new setup is basically peeling the top and sides off the cart, enlarging them, and fixing them to the wall. Your plane storage set-up is nothing short of brilliant. It is probably about the most practical and usable design that have seen. It appears there wouldn't be a problem 'finding the slot' when you want to get it off the bench and out of the way. No hooking, sliding or clipping. Nice stuff. I'm even impressed that you left a space to the right for a large-screen tv. It is for a tv, right? Well of course, I was thinking of putting a flat-screen TV there, but I've ended up adding another panel section and filling it all with tools! Turns out I've collected quite a few chisels scouring flea markets. Very clever SIMPLE storage solutions! Niels, you hit the nail right on the head, time working in the shop, not on it! Very nice. I intend to build one very similar. What is the slope on your plane till? Thanks! The till is 12" deep and 21" tall.